All Bothwell homes currently listed for sale in Bothwell as of 04/22/2019 are shown below. You can change the search criteria at any time by pressing the 'Change Search' button below. If you have any questions or you would like more information about any Bothwell homes for sale or other Bothwell real estate, please contact us and one of our knowledgeable Bothwell REALTORS® would be pleased to assist you. "PRICE REDUCTION! OPEN HOUSE FRIDAY APRIL 5th from 3pm to 7:30 pm! 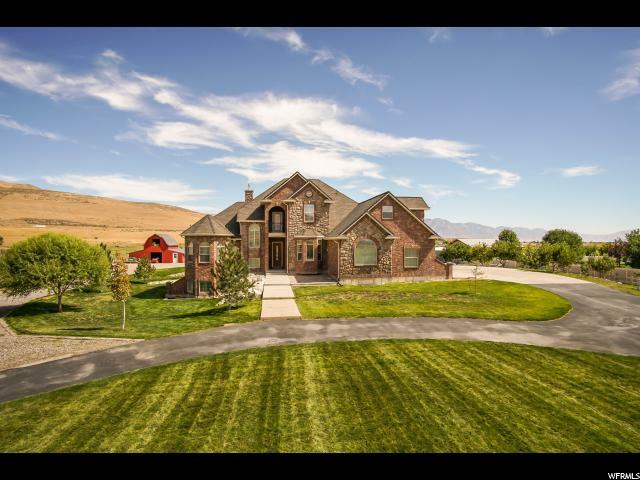 Beautiful Tremonton Horse Property Estate Now Available for Purchase! This immaculate, spacious home sits on a beautiful 5 acre lot with mountain and valley views. The well kept 2 story modern home has large open common areas for entertaining along with 6 large bedrooms with the master on the main level. Hand-scraped maple flooring in the kitchen, beautiful hickory cabinetry throughout the home and custom granite countertops, (kitchen and all bathrooms) hearth and mantle exude country class. Radiant heat in the tiled areas (entry way and master suite bathroom) on the main floor are sure to keep your toes toasty warm. The entire basement flooring has radiant heat on 3 separate zones. Roomy basement has 9 and 10 ft ceilings. The home also has a 1,000 square foot unfinished suspended slab area downstairs (with radiant heat on its own zone) ready for a workshop or home theatre. The property is fully landscaped with fruit trees, gardens, hay fields, barn and comes with 5 shares of pressurized irrigation water. This home is completely turn key, just bring your animals and enjoy all this home has to offer! Click on the Tour link above to see the beautiful aerial footage of this incredible property." "An incredible 7.5 acres with water shares!!! (6 Bear River water shares and 6 Stevenson Farms water shares) You've found your Country gentleman's ranch out here in horse country next to Tremonton. Breath of fresh air with few neighbors and stunning views. 3 full baths with 2 of the 3 having additional seperate walk in showers! Many storage closets. Large cold storage under porch. Bright basement with daylight windows with walk out to covered patio. Washer and Dryer & stainless steel fridge stay. Walk out balcony off of formal dining area as well as off Master bedroom. Jetted tub in Master and large walk-in closet with vaulted ceiling. Fireplace in Livingroom. Warming drawer under wall oven. Deep garage. large garden area. Fruit trees including apple, apricot & pear. Owner is leaving the horse fence panels and irrigation watering equipment for use in the grass pasture. A must see. Pictures can't do it justice!! "